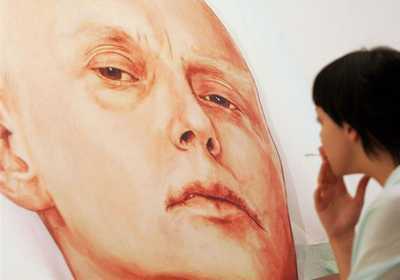 This painting by Dmitry Vrubel and Viktoria Timofeyeva on display in the Marat Guelman gallery, Moscow, in 2007 depicts Alexander Litvinenko on his deathbed in London in 2006, suffering from radiation poisoning by polonium-210. Sir Robert Owen's long-awaited inquiry found that he was poisoned by Andrei Lugovoi and Dmitry Kovtun in the Pine Bar of London's Millennium Hotel. They left a trail of polonium-210 behind them. "His murder was 'probably' approved by President Vladimir Putin" (CLICK). 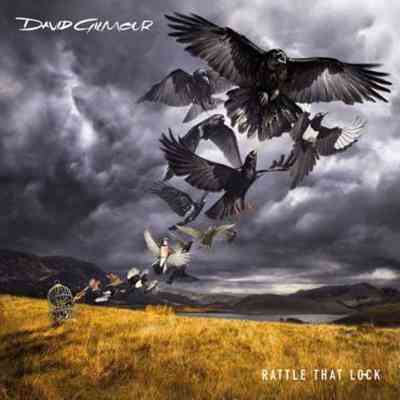 David Gilmour's latest record Rattle That Lock has won Art Vinyl's annual prize for the year's best album artwork, selected from 50 entrants (CLICK). Here's another of those so-called "performance artists": Milo Moire. She stripped naked outside Cologne Cathedral to protest against the assaults against women on New Year's Eve. She holds a poster reading "Respect us! We are no fair game, even when we are naked!!!" (CLICK). I must admit I'm still hooked on Death in Paradise, despite the loss of Ben Miller and sara Martins. It's so different from the BBC's usual dross. The new series begins this evening on BBC ONE at 9pm. Shown is Joséphine Jobert, who plays the glamour cop (CLICK). Christie’s in London will present its annual sale of ski posters on 21 January 2016. This is the only auction dedicated to ski posters worldwide. Prices start at £700. 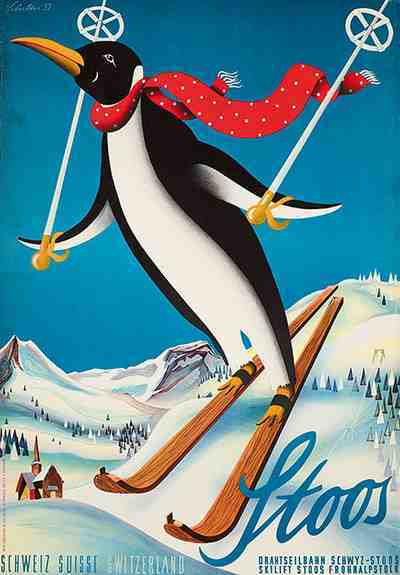 Shown is a Ski Poster by Hans Schilter from 1957, estimated at £2,000 - £3,000 (CLICK). 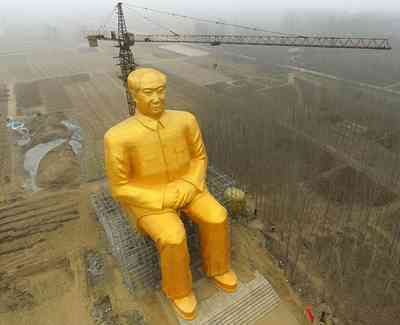 This huge gold-painted statue of Mao Zedong - some 37 metres high - has been erected in Henan province by a group of Chinese capitalists at a cost of 3 million yuan ($460,000). It took 9 months to construct and was completed in December 2015. The fact that Moa's economic policies caused an estimated 40 million Chinese people to starve to death seems to have slipped their minds (CLICK).